This week’s That’s Maths column in the Irish Times ( TM036 ) is about bores. But don’t be put off: they are very interesting. According to the old adage, water finds its own level. But this is true only in static situations. In more dynamic circumstances where the water is moving rapidly, there can be sudden jumps in the surface level. When fluid at high speed surges into a zone of slower flow, an abrupt change of depth, called a hydraulic jump, may occur. Hydraulic jumps are found in some river estuaries, below dams and weirs and even in the kitchen sink (see next post). 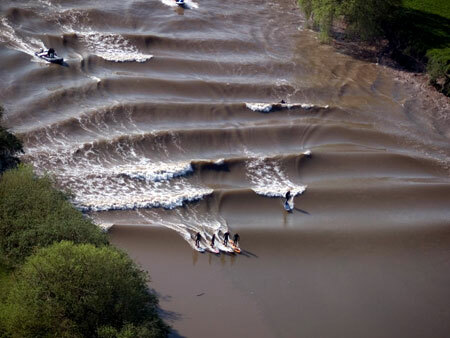 When the tide floods into a funnel-shaped river estuary, it can form a wall of water called a tidal bore that travels rapidly upstream against the current. The most notable example in this neighbourhood is the River Severn, where bores are observed several times each year under suitable conditions of Spring tide. Typically, the flow is smooth or laminar upstream from the bore. Downstream it may be either wavelike (an undular bore) or chaotic (a turbulent bore). Tidal bores propagating briskly upstream are popular with intrepid surfers, who ride them for miles up the river. But there are also stationary hydraulic jumps on a river, often found in the spillway of a dam or below a weir. These have recirculating water that traps flotsam and they provide entertainment for kayakers prepared to risk the hazard of being caught in the back-flow. Characteristics of a hydraulic jump (image Wikimedia). A relatively simple mathematical analysis yields information on the height of a hydraulic jump and the speed of propagation of a travelling bore. An early study was carried out by Jean-Baptiste Bélanger (1790-1874), a French engineer, who derived an expression for the difference in height by means of conservation principles. Gustave Eiffel was one of his students, and Bélanger’s name is inscribed on the Eiffel Tower. Let us denote the water depths on each side of the hydraulic jump by H1 and H2. It might seem reasonable to apply the principle of conservation of energy to derive an expression for the depth ratio H1 / H2. The problem is that there is energy dissipation at the hydraulic jump, so the conservation principle does not hold. This dissipation is exploited by engineers who design spillways to generate bores that remove destructive energy. Where Fr = V / √(gH) is the Froude Number. This is what we now call Bélanger’s Equation. where inflow values are used for the flow speed V and the depth H, which determines the wave speed. Although Bélanger used this ratio in his work, he did not give it a name and it is now called after William Froude (1810-1879), an English engineer, hydrodynamicist and naval architect who formulated laws for the resistance of water on ships. A hydraulic jump occurs if the Froude number exceeds 1. The condition Fr > 1 is called supercritical flow. Above the bore, the water is shallow so the wave speed c = √(gH) is small, making the Froude number large. Downstream, Bélanger’s equation implies that H2 > H1 so there is deeper water. Moreover, the flow speed is less, so we have Fr < 1, a condition called subcritical flow. Thus there is a transition from supercritical to subcritical flow across the bore. Hydraulic jumps continue to provide opportunities for engineers, sport for surfers and challenges for physicists and applied mathematicians. Who would have thought that bores could be so interesting? Limerick city is at the point where the river water meets the sea water of the estuary.